There are 6 games styles for the game of "Fool"
1. "Child" - style of game of the child which is frequently confused in cards and goes the first got cards, and is beaten off frequently all over again by trumps, and after that only on color. 2. "Simpleton" - style of game of the adult person which all over again is beaten off but only then thinks how resembled. 3. "Enthusiast" - style of game of the adult person which all over again thinks, then only is beaten off, and also non-standardly can resemble at the end of game with the purpose though time to win. 4. "Maniac" - style of game of the person which wants to shower the contender with cards that the contender of them has taken, not thinking that the purpose of game consists not in momentary success. 5. "Roller" - style of game of the card sharper. He, as always, can have some packs, he can throw off a superfluous card in a pack be beaten off twice by the same card etc. In game with "sharper" check on "swindle" is stipulated. It means, that if you lose "sharper" to you at the end of game it is enabled to choose 3 or 5 cards depending on a level "swindle" with which, in your opinion, "swindled" "rolled". If you guess even 1 card the victory is set off to you, otherwise the victory is set off "sharper". 6. 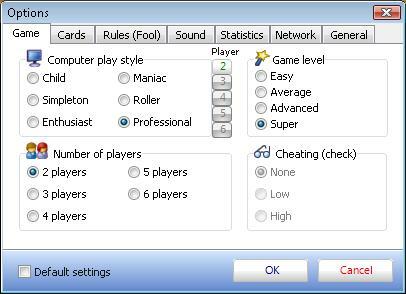 "Professional" - all life devoted to a card play, certainly, he can play style of game of the person and as rolled, but in the given game he plays absolutely fairly, considering each course and some more courses forward. 3. Choose any of the 6 styles. If you are playing against several other players you may set a different style for each of the players.